You spend a third of your life in bed and having the right mattress is important to the quality of sleep you experience. Sealy sleep systems are designed to offer your body the right amount of support, while providing you with a superior level of comfort to relieve pressure points. Handcrafted to order in Australia using the latest in quality, locally sourced materials. Sealy have been providing Australians with the support they need to sleep better for over 65 years. Sealy is dedicated to providing a sleep set with a range of features that help deliver a great night's sleep. The correct alignment of the skeletal system assists in achieving proper relaxation of the muscles during sleep. 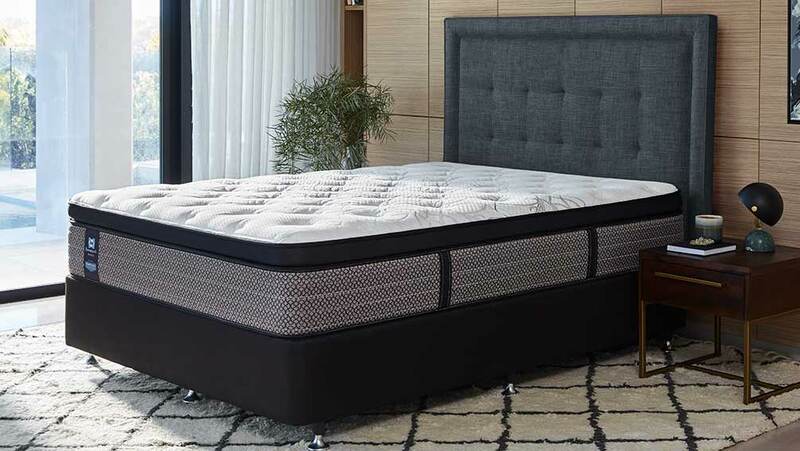 Sealy spring units are designed to sense a body's shape and position, and to help give the perfect amopunt of response top assist in supporting and aligning the body. When lying down, certain parts of the body are prone to pressure points including the hip and shoulder areas. This can create poor circulation and may result in increased tossing and turning. Sealy’s high quality pressure relieving materials are designed to help conform to the body's shape,assisting to disperse weight and relieve pressure points. A reduction in tossing and turning assists in reducing partner disturbance. Great comfort and support have no value if a mattress loses its durability and performance in a short time. Sealy is a leader in bedding research & development with its very own NATA accredited testing facility. Vigorous testing of raw materials and finished product ensures that Sealy products perform at a high standard over a long period of time. The Sealy Posturepedic range combines precision engineering with outstanding aesthetics. A dedicated team of Sealy engineers and designers have spent hours of research and rigorous testing to bring the latest in a long line of leading technologies to life. Exclusively developed and made in Australia, Sealy Posturepedic features the unique ReSTII coil. A true Responsive Support Technology designed to perfectly cradle and support every part of the body. Opulence and quality work together with Sealy’s Crown Jewel Collection. Hand crafted quality - Using quality materials such as natural latex and high resilience Infinilux. Hand-tufting and flag-stitched corner wrap handles, vents and rounded corner guards for enduring function and comfort. Exceptional sleep - Opulent fabrics, luxurious comfort and refined details combine with the Sealy Posturepedic ReST II® support system with Titanium alloy. Cradling support and luxurious comfort combined. ComfortCore® Luxe - Provides conformance and pressure relief for your lower back, so tired muscles can recover. Bed base technology - Sealy’s MicroTek® bed base provides you with resilience and stability.